Perfect Combination of Reef Nutrients. Calcium Chloride & Sodium Carbonate are pre-measured to make 1 gallon each when combined with RO/DI water. The Magnesium Sulfate and Magnesium Chloride combine with RO/DI water to make 1 single gallon. 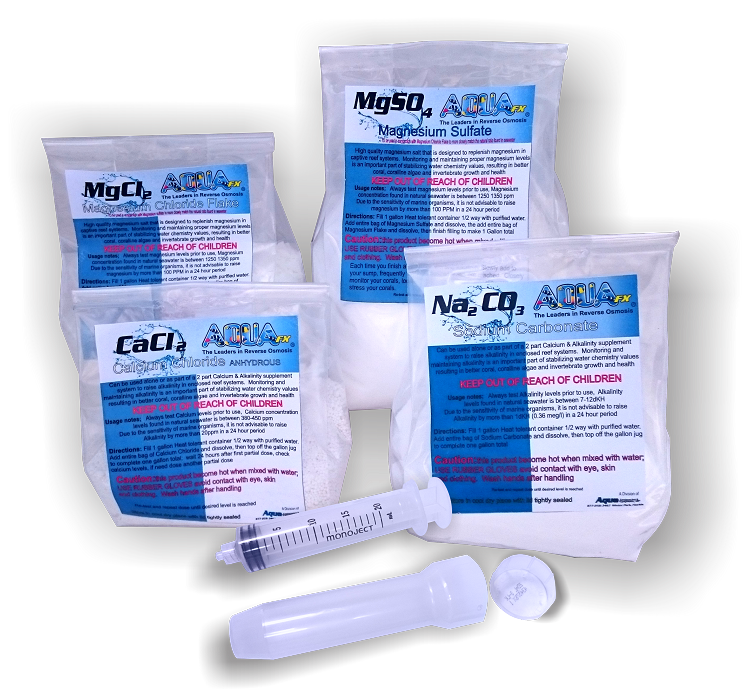 AquaFX Calcium Chloride is perfect either by itself or as part of a Calcium and Alkalinity duo to raise and maintain appropriate calcium levels in your reef system. Monitoring and confirming that calcium levels stay at an appropriate level will ensure better coral growth, Coralline algae, as well as, invertebrate growth and health. It is always important to only use RO/DI water when dissolving your Calcium chloride. It is HIGHLY recommended to dose in partial increments of either 1/2 or even 1/3 of the total dose. Wait for at least 24 hours after the first partial dose, check the new Calcium levels and dose again only as needed.